Provides reference correction for protein NMR spectra. Bayesian Model Optimized Reference Correction (BaMORC) is utilizing Bayesian probabilistic framework to perform protein NMR referencing correction, currently for alpha and beta carbon-13 chemical shifts, without any resonance assignment and/or three-dimensional protein structure. For more detailed explanation, please refer to the paper "Automatic 13C Chemical Shift Reference Correction for Unassigned Protein NMR Spectra" < https://rdcu.be/4ly5> (Journal of Biomolecular NMR, Aug 2018)" . The BaMORC package is designed to facilitate protein NMR research with an easy-to-use tool that detects and corrects 13C referencing errors before and after the protein resonance assignment step. Functions for calculating referencing correction value for assigned and unassigned carbon protein NMR spectra: bamorc() and unassigned_bamorc(). read_raw_file(), processing user-provided data file. read_nmrstar_file(), automatically process BMRB Star 2.0 and 3.0 files. read_db_file(), automatically fetch BMRB data and output appropriate format via BMRB entry ID number. JPred secondary structure estimation wrapper: jpred_fetcher(). CLI functions for using shell. BaMORC wouldn't be possible without the hard work of the authors of RBMRB and jpredapir. Thanks! 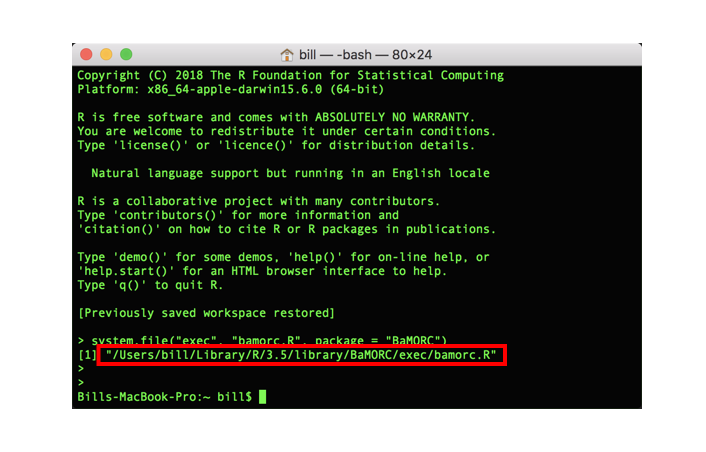 You will see the R script location print out in the terminal as shown in following image. And to test the R CLI script using the following pattern. initial preparation for CRAN submission on CRAN 2018-10-18.